The best natural arthritis treatment? Antioxidants. Just about everyone who has arthritis is looking for a natural arthritis treatment. Why? Because the "regular" treatments available aren't very good. I know. I'm a pharmacist, but I'll admit it. The drugs we use, called NSAIDS, can only mask the symptoms. They do nothing to treat the underlying cause of arthritis. There's even good evidence to show that they may actually increase the damage. And unfortunately, they're usually only effective during the early stages of the disease. Once your joints degenerate to a certain point (and they will), the drugs just don't cut it anymore. NSAIDS can also have some serious side effects- they decrease the protective lining in your stomach, which can lead to ulcers. In the US alone, over 100,000 hospital admissions and more than 16,000 deaths are because of the intestinal bleeding caused by NSAIDS. With such serious consequences, it's clear we need to find a better alternative. What you need is something that stops the underlying problem, so you can stop or slow the progression of arthritis. THAT would be true arthritis treatment. While you don't generally die from arthritis, it can cause some serious pain and disability. That's why you're here looking for an arthritis treatment, right? First, you need to understand what arthritis is. Technically, it means "inflammation of the joint". There are 2 main types of arthritis: osteoarthritis and rheumatoid arthritis. Both involve joint inflammation, but the cause of the inflammation is different. Osteoarthritis is the most common (it affects up to 80% of the population over 50), and is what most people mean when they're talking about arthritis. 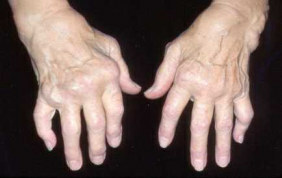 Rheumatoid arthritis is actually an autoimmune disease that is extremely debilitating and, thankfully, not as common. I have a page dedicated specifically to rheumatoid arthritis, but read this one also, because most of the information applies to both types. Generally speaking, if you live long enough, you will get osteoarthritis. Also known as degenerative arthritis, it is pretty much the result of wearing out your joints. It can affect any joint in the body, but the larger, weight-bearing joints are most commonly affected: knees & hips- makes sense, since they've had a lifetime of stress put on them. The more stress put on the joint, the faster it gets worn out. Stress can be from excess weight, injury or activity. Before you can choose an effective natural arthritis treatment, you need to know what is happening to your joints, so you can stop the underlying problem. Otherwise you'll just keep getting worse. 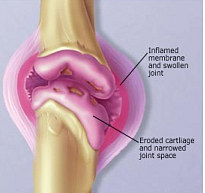 Arthritis is basically the result of the destruction of the cartilage in your joint. Cartilage is the cushion of your joints. It is at the end of your bones and the larger joints, like your knees, have extra for added cushioning. Your joints are also lubricated with synovial fluid to allow everything to move smoothly. For you mechanical types, the cartilage is like the washer and the synovial fluid is like the grease. Cartilage is constantly being worn down and must be rebuilt at the same rate to keep the joint healthy. When the breakdown happens faster than the building, that's when the joint starts to wear out. Excessive free radical damage in the joint is the underlying problem of arthritis. When the fluid from an arthritic joint is analyzed, there is a huge concentration of free radicals. Fluid from a normal joint has no free radicals. Remember how destructive free radicals are right? So the more that are there, the more damage is being done. The complex processes of the inflammatory response itself(which I won't bore you with) actually are responsible for generating even more free radicals. It becomes a "vicious cycle"- free radical damage causes more inflammation and more inflammation causes production of more free radicals. So it kind of feeds on itself. Hence the importance of antioxidants in the treatment of arthritis. Since antioxidants literally destroy free radicals, you need to have enough in your joints to stop the damage being done. Go to natural anti-inflammatory if you want more specifics of how it works. Several studies have corroborated this free radical theory. For example, those people that have low levels of beta-carotene, vitamin E and selenium (these are all antioxidants) have been shown to have a significantly increased risk of developing rheumatoid arthritis. Another example is that those with more severe arthritis and rapidly progressing disease have low levels of vitamin C & D.
There are now many ongoing and completed studies using several different antioxidants to actually treat and reverse both osteo and rheumatoid arthritis. Results have shown improvement of symptoms, reduced cartilage loss and slowed disease progression. Here's the beauty of antioxidants: Not only are they a natural arthritis treatment, they are a true arthritis treatment. As I mentioned above, pharmaceuticals are only a bandaid solution for the symptoms of arthritis. They do nothing to stop or slow the disease process itself- they may even accelerate the damage. To me, that's not a treatment. AND antioxidants have no side effects- the pharmaceutical alternative for arthritis treatment has many side effects- pretty serious ones I might add- even deadly! Glucosamine is an important part of the construction of cartilage. It's the main part of a molecule called proteoglycans, which gives your cartilage elasticity. Proteoglycans actually bind the water that lubricates and cushions the joint. Besides being an important building block of cartilage, glucosamine also seems to increase your body's production of cartilage by encouraging more production of collagen and proteoglycans. Glucosamine also makes your synovial fluid (the cushioning fluid in the joints) make more hyaluronic acid, which gives the fluid its lubricating and shock-absorbing properties. Studies have shown that taking 1500-2000mg daily not only improves symptoms, but actually helps rebuild damaged cartilage. If you've been looking for a natural arthritis treatment, you have probably already heard of glucosamine sulfate. You may have even tried it. If that's the case and you're still looking, I can only assume that it hasn't really worked that well for you (if at all). You're not alone. That's the experience I had myself (and everyone else I know that has tried glucosamine). If you read the first half of this page, you've probably already come to that realization. Antioxidants are what's actually stopping further damage to the joint. No point having glucosamine to rebuild damaged cartilage if you've still got all those free radicals hanging around to just damage it again. No wonder you don't notice any improvement. Collagen and proteoglycans make up the majority of cartilage. Collagen basically gives cartilage its strength. Again, no point increasing the production of proteoglycans with glucosamine if you don't have enough collagen to mix it with. Vitamin C and silicon are necessary for the proper production of collagen. The challenge is, of course, finding all this stuff. Seriously, where are you going to find circuminoids and silicon? But like any recipe, you need all of the ingredients to get the results you want. I actually found a product that combines all of these things into one supplement. If you're going to have to take glucosamine anyway, why not just take one thing that gives you everything you need? I'm truly not exaggerating when I say that this product is amazing. The success stories I have personally witnessed are almost miraculous. Literally everyone that I have recommended it to has had success with it, when they have already tried (and failed) with everything else- including glucosamine. One of my friends was even able to cancel his 2nd hip replacement because he didn't need it anymore. Wow! I know, I know- what's the name of this magical arthritis treatment already, right? I wish that I could just tell you right here, but unfortunately, due to legal reasons, I'm not allowed to mention brand names on my website. It's a real pain, but there is an easy way around the problem. It only takes a few seconds and don't worry, I absolutely promise that your information is only seen and used by me to get you the information. I know it's an inconvenience, but trust me. You won't be disappointed! The e-mail you'll receive not only has the name of this amazing product, but I'll also give you my complete nutritional recommendations for natural arthritis treatment.